The Soulja Boy saga continues. Despite the fact that Soulja Boy (DeAndre Cortez Way) claims Fortnite is coming to his various rebranded video game consoles, Epic Games, the studio behind Fortnite, has confirmed the title will not be released on rapper’s systems, ever. 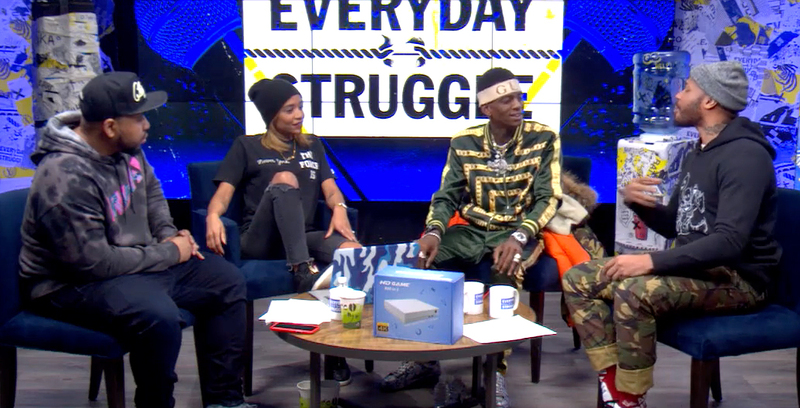 During an appearance on Complex’s ‘Everyday Struggle’ YouTube show, Soulja Boy made an effort to defend his recent efforts in the video game industry, going so far as to claim that Fortnite, the popular battle royale game, is soon coming to his line of bootleg consoles. Though there have been multiple allegations concerning Nintendo launching legal action against Soulja Boy’s consoles. The rapper has repeatedly stated on multiple podcasts and YouTube shows that he holds the licenses for all of the games built into his systems, including the NES, GameBoy Advance and even Sony’s PlayStation titles. The rapper’s most recently released system is the SouljaGame Handheld. Soulja Boy also claims that he’s forging a partnership with Nintendo despite rumours of the Japanese gaming giant taking legal action against him. Further, Soulja Boy claims that his next video game console will be able to play over 800 PlayStation 4 games. To put this entire fiasco in perspective, there is no way Nintendo, a company notorious for relentlessly protecting its IP, would ever allow its titles to be officially played on what is ostensibly a rebranded emulator box sold through the online retail platform Alibaba. Update 01/22/2018: Despite Soulja Boy discussing his online store during various media appearances, the rapper’s digital store has been offline for a number of days. He claims that a former cameraman hacked his site and took it down. everyone tell @ShopifySupport @Shopify to contact me asap please and thanks its about my site https://t.co/DFSirR0FZ9 my ex-cameraman hacked my site and took it down lol at the haters nothing but the devil. You can't stop me i only tried to help you. God is good!